Zoe Brodie-James has written a number of articles on the welfare of ducks for us, some of which have been quite moving but none of them have been quite so emotive as this one which focusses on foie gras [liver fat] and its production. Gavage [noun: The administration of food or drugs by force, especially to an animal, typically through a tube leading down the throat to the stomach]. My university lecturers drummed into me the importance of being objective and to critically analyse reference material when writing anything. I then, in turn, encouraged my students to do the same. With a keen interest in commercial meat duck welfare I have seen some distressing sights in large-scale meat duck rearing units and have managed to rationalise these welfare issues to some extent in order to be able to be ‘objective’. So, with my rational and objective head on I was keen to go to the next level of commercial duck welfare and investigate foie gras production. As foie gras production is implicitly banned in the UK I could not visit any fattening sheds (more about the legislation later) so I dutifully trawled through all the available reference material from objective scientific studies published by peer-reviewed journals, through to undercover footage filmed in the very worst of the ‘fattening’ sheds. I looked at the medical and behavioural science behind the welfare concerns along with the socioeconomic and cultural arguments for its production and at no point during my research did I read anything that could warrant the continued production of this ‘gourmet food’ product. 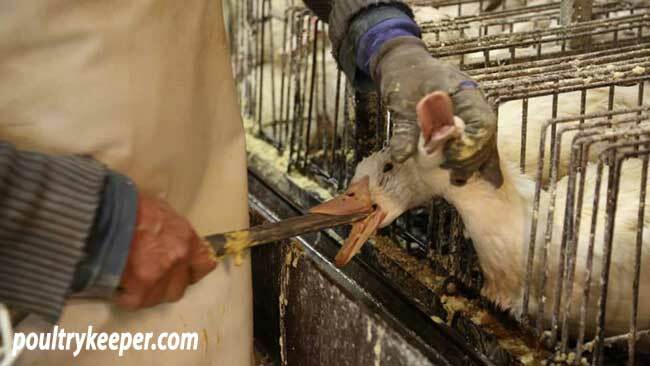 Why is the production of foie gras so indefensible? Surprisingly not everyone knows what foie gras is. I was at a restaurant in a large castle hotel in Bovey Tracy earlier in the year, foie gras was on the menu. Out of a group of 12, at least half didn’t really know what is was and gave it no thought. One diner, who knew what it was, (but perhaps didn’t know the cruelty behind its production) was considering ordering it. Hushed mutterings with glances in my direction followed and the diner swiftly changed their supper option. Rumour has it there was a similar incident back in the eighties involving Chrissie Hynde and some music journalists, unfortunately they didn’t change their menu choice and thus forth were forever cursed by the aforementioned musician. For those that don’t know, as the title suggests, ‘foie gras’ simply put is fatty liver produced from force-fed ducks and geese. In France, most foie gras comes from ducks with a very small percentage from geese. It is produced mainly in France, with Hungary, Bulgaria, the United States, Canada and China also having a worrying, thriving foie gras industry. (To make matters more sinister, foie gras is also a by-product of the live plucking for down industry in Hungary, a controversial subject for another time*). Typically ducks are kept free range for around 2.5 months and then for two weeks they are confined to individual cages** and force-fed 3 times a day using a metal funnel and tube system to administer large amounts of grain into the stomach. This in turn causes the liver to swell to up to ten times it’s normal size, the grain causing the coveted yellow colouring of the fat. If not slaughtered soon after, the birds would likely die as a result of this. It has been reported that up to a million birds in France alone die during the process of force feeding. Freedom from hunger or thirst by ready access to fresh water and a diet to maintain full health and vigour – birds receive a diet that causes them fatal liver disease. Freedom from discomfort by providing an appropriate environment including shelter and a comfortable resting area – birds are confined to tiny individual cages with no room to even flap their wings or turn around. Freedom from pain, injury or disease by prevention or rapid diagnosis and treatment – every part of the force feeding process causes pain, injury and disease. Freedom from fear and distress by ensuring conditions and treatment which avoid mental suffering – no explanation needed here I think you will all agree. The evidence detailing the suffering involved in the production of foie gras is irrefutable so how can the industry justify its production? Currently, within the EU, the production of foie gras is prohibited by treaty which is then implemented in domestic law except for where it is current practice (countries such as France and Hungary as outlined above). So why can’t the countries who have banned its production then ban its import? The import of goods worldwide is regulated by the World Trade Organization (WTO). In an effort to promote fair trade worldwide, the WTO state that a country cannot ban the import of a product based only on the way that product has been produced, (unless the production methods have caused human suffering). So as an example, if a country decided to place a ban on the import of foie fras, France could make a complaint to the WTO and possibly have the import ban lifted. In 2014 India implemented a ban on the import of foie gras (among other products) for animal welfare purposes, until another country challenges this ban, we will not know how the WTO will rule. Whatever the outcome, it would set a precedent for the future. So why don’t all EU countries have to comply with EU law? As with most things, economics tend to win over animal welfare concerns. France states that they have over 35,000 people involved in the foie gras industry and to ban it would cause serious economic issues. A similar figure is cited for the goose industry in Hungary. France also claim that foie gras production is part of their national cultural heritage as such should be protected. In regard to the rest of the world, there are ongoing legal disputes. After legislative change, the state of California banned the sale of foie gras in 2012, however in 2014 the ban was overturned on a technical point, the case is still being appealed. São Paulo, Brazil also have a similar ban in place. 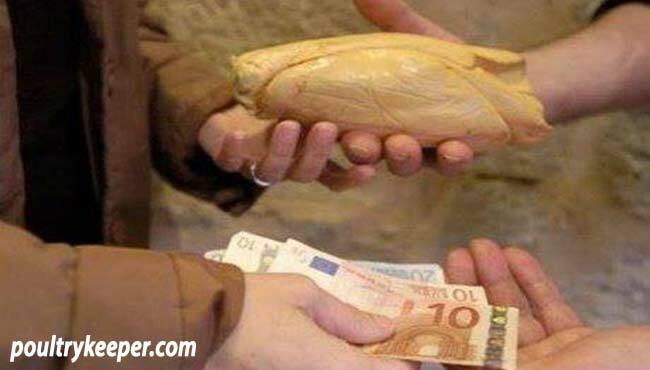 In the UK there is constant pressure from many groups to ban the sale and import of foie gras. Currently there are no major supermarket chains selling it, with some high-profile retailers also taking it off their shelves. Waitrose have gone to some effort to appease both sides by producing ‘faux’ gras, which is a by-product of their Christmas goose production. There is an argument that foie gras can be produced ethically without force feeding as demonstrated by Spanish farmer Eduardo Sousa. Edward lets his geese free range and offers them no supplementary feeding whatsoever. He explains that the geese gain their fatty liver utilizing their natural feeding habits with the coveted yellow colouring coming from grazing wild lupins. No doubt if you look far enough back in history, all fatty liver was likely produced in a similar way, sadly this production method is unlikely to be realized within commercial industry. 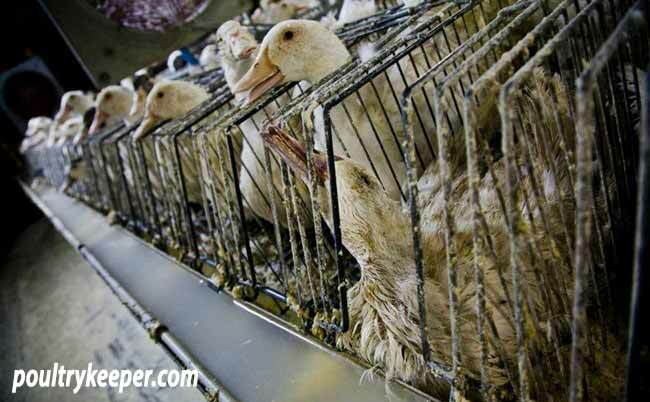 So who really wants to eat foie gras? It is traditionally a French ‘delicacy’ and even though there are large number of French citizens that are opposed to it, foie gras still remains ‘the norm’ in French cuisine. Outside of France, foie gras seems to still be seen as a ‘gourmet’ food among a certain type of person. Call me a cynic, but If I were to throw my objective hat to the wind I would guess that type of person has no issue with (or perhaps knowledge of) the suffering involved in the production of foie gras, and may only be seen to take offense to it if it were the wrong shade of yellow and perhaps clashed with the hue of their crocodile skin bag and fox fur coat. The most simple way of helping is to simply stop eating it and encourage others to do the same. If you see it on the menu at a restaurant, express your concern to the chef, better still, call the restaurant beforehand and ask if they ever serve foie gras, if the answer is yes then politely explain that you find the product distasteful and will be booking elsewhere. With no demand there will be no need for supply. VIVA! have been working with animal welfare lawyers to find the best way of bringing about a solid legal case to enforce an import ban and consistently campaign against foie gras. More information can be found here. CIWF (Compassion In World Farming) are also working with welfare groups EU wide including the French group L214 campaigning to bring an end to the production and import of foie gras. More information can be found here. All images courtesy of: StopGavage.com Facebook page. * Ethical down production. The introduction of a traceable down standard. Article coming soon. ** Single occupancy cages are to be legally replaced by ‘group’ force feeding cages by the end of 2015.